The evil ninja Hanzo has returned and wants control of the ultimate power. He has captured your girlfriend, and with the spirit of the ninja who once defeated Hanzo, it is up to you to defeat him once more! The first boss, Kabuto, has been said to first be named "Mari-Oh", showing the rivalry between Nintendo and SEGA. 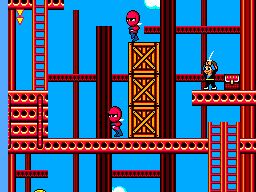 This was also the last game that Alex Kidd would star in on the Sega Master System. You play as Alex Kidd, obviously. But instead of the normal "Jump, run, punch, kick" action, you now have a sword, the occasional shuriken, and the occasional magic attack. It's mainly just the typical sidescroller, jumping from left to right and such. There are many enemies that have different powers, such as a shirtless man who throws knives, an evil yellow ninja who shoots bullets, a ninja who just runs around, a green ninja who is an expert at jumping, and a shuriken-throwing ninja. There are several attacks. You always start with your sword, but by opening several hidden treasure chests you can often get a heart to replenish life, a 1-Up, or the attack power-ups. These include an even more powerful sword that can reflect enemy shurikens, a dart attack where you throw darts at the press of a button, and a tornado-like attack, where tornados are thrown around the screen, destroying everything everywhere. Alex also turns into a tornado, and can be controlled to run into enemies and destroy them. The game is very easy, though. The bosses include Kabuto, Heli, Robster, and Hanzo. The first boss has two forms, a big and small one, and they are both pretty easy. The second boss, Heli, is a giant machine that shoots out helicopters. The third, Robster, is just a giant lobster that jumps around while attacking. The final, Hanzo...Well...I'll save that for you... There are a few special moves. These include the fireball, in which Alex turns into a giant ball of flames, and shoots in a direction. Alex can usually start this by grabbing onto a pole or stick-like object of some sort. Another special move is the wall-kick, in which you can jump off walls repeatedly. The last is the water-jump, in which you can glide over water. The levels can be very different for each zone. The levels include underwater, the streets, a boat dock, and more. The graphics are typical for the Sega Master System, but the thing that really catches my attention is when Alex performs the fireball attack. The animation looks great for an 8-Bit system. It is also pretty cool when Alex falls from a great height, because he opens his mouth like he is screaming. They could have changed the graphics a bit for instance by changing Alex's robe colors. It's just pure black, and nothing else. I also would have liked to see more boss animations. With the very few attacks they have, they could have spiced them up instead of just having a chop that causes a fireball to appear, for instance with the first boss. The dying sequences should have been better, too. For every boss there is just a puff of smoke that appears, and nothing else. 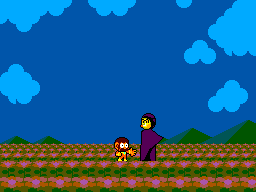 There is no blood, either, but you can't expect much in an Alex Kidd game, none the less. He has "kid" in his name. Be sure to look at the moon in the sky on Kabuto's stage. Look at the size of those lips! The sound was pretty good. Another good thing about the fireball move, the sound. One of the best 8-bit sounds for fireballs I've heard. The jump sound is the typical "boing", and the sword chop isn't that different. The music is great. There is mainly just one song, but changed for each level. It often changes tempo or pitch, giving it a new feel. In one level, it's sad, in the next, it's happy. But you really have to listen to the music, because you can often skip through the game in twenty minutes without even paying attention to it. The controls are pretty good, besides a few flaws. The jumping is very smooth, but when you are often doing the wall-kick, you can screw up constantly by not having pressed the right button at the exact time. When water-gliding, it's the same thing. I often sink because the timing is not correct and not on the exact second. When the fireball move is performed, you often cannot move on the obstacle you are spinning on, so that can be annoying. You have to stop spinning completely if you want to change direction in order to do what you want to do. The special moves aren't used too much in the game either, so don't worry too much. This game is not too replayable. Once you beat it, you know where everything is, and how to destroy everything, so it's nothing new. There are a few secret places and such in the game, but besides giving you a few extra points, nothing new happens. Another factor that adds to the non-replayability of this game is the easiness. I can beat the first three levels in less than four minutes, so it doesn't really feel like a game after you are just repeating the same layout in your head of how to beat each level to get to the next, without even thinking. An annoying thing in this game is the low-life count. They probably did this so you would not beat it the first time you played it. There are only about three lives you start with, and only one continue. And when you continue, you start out at the first level of whatever zone you are in, so you have to replay the levels over and over. Why do you want this game? 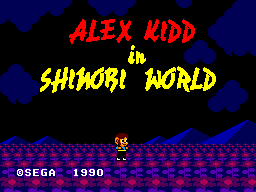 Well, it's pretty cool to see Alex Kidd do something else than just jump and punch, and it's a break from the normal Shinobi ninja games. Overall, the game is a buy if you want to complete your Alex Kidd collection. But if you see it cheap in a store, or your friend has it, or maybe you even know of a video game rental store, then get it, and you won't be sorry. It's a fun game, but after you beat it, no more. I still have not beaten it yet, but I am up to the last round, and I keep having to play the levels past over and over. That is the annoying part of the game. As said before, there is almost no replayability value here. So if you see a copy, buy it, but if you ever come across one for more than six dollars (US), then just pass it by.